Hamstring strains are the most common muscle strain in athletes and are most evident in sports that require high running, speed and power demands. The hamstrings are very powerful and require a lot of eccentric contraction to slow the leg/control it when we run. Most patients report a sudden sharp pain when they tear a hamstring. Some are able to continue with the activity they are doing while others are not so lucky. When do hamstring strains occur? 69% of hamstring injuries have a running related mechanism. The most common mechanism is during rapid acceleration but hamstring strains can also occur from a stretching manoeuvre e.g. forced over stretching with dancers. Where do hamstring strains occur? It is most likely to occur at the musculotendinous junction but tears can also occur within the tendon or muscle belly. 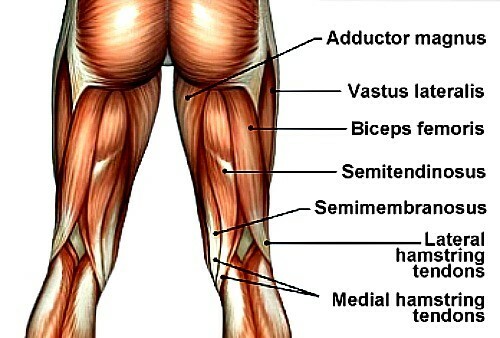 The biceps femoris is most commonly injured hamstring muscle and accounts for 83% of hamstring injuries. What are the different grades of hamstring strains? As a rough guide a grade 1 hamstring strain can take 3 weeks to heal, a grade 2 strain 4-6 weeks, and a grade 3 strain can take 6+ weeks. This will vary depending on factors such as age, previous history of hamstring strains, region of the tear, and correct rehabilitation. Apply the RICE first aid method: Rest, Ice, Compress and Elevate, and make an appointment with a physiotherapist. What is the risk of future re-injury? There is a 13-63% chance you will re-tear your hamstring again up to two years post injury. The greatest risk of re-tearing occurs in the first month after returning to sport. Due to this, it is important that you seek professional advice from a physiotherapist in regards to treatment and rehabilitation to ensure the best possible outcomes. If you are experiencing pain it is always advisable to seek advice from a physiotherapist for correct diagnosis, treatment and for an individually tailored rehabilitation plan. Henderson G, Barnes C, Portas M. (2010). Factors associated with increased propensity for hamstring injury in English premier League soccer players. Journal of Science and Medicine in Sport 13. p397-402. Freckleton G, Pizzari T (2012). Risk factors for hamstring muscle strain injury in sport: a systematic review and meta-analysis. British Journal of Sports Medicine- 2011-090664. Published online first: 4 July 2012. Warren P, Gabbe B, Schneider-Kolsky M, Bennell K. (2008). Clinical predictors of time to return to competition and recurrence of following hamstring strain in elite Australian footballers. British Journal of Sports Medicine-10.1136/bjsm.2008.048181. Published online first: 14 August 2008. Woods C, Hawkins R, Maltby S, Hulse M, Thomas A and Hodson A (2004). The footness association medical research programme: an audit of injuries in professional football- analysis of hamstring injuries. British Journal of Sports Medicine. 38(1):36-41.